So you’ve booked Thirsty Swagman’s Beer or Bust tour, and have studiously researched what to expect at Oktoberfest. You know what the Stuttgart Beer Festival has in store for you, and you have a handle on the scene in Rothenburg ob der Tauber. But what do you need to know about drinking in Prague, the capital city of the Czech Republic? Don’t worry, thirsty traveler — we’ve got you covered. Here are five delicious beverages you’ll want to drink in Prague. Let’s start with the obvious: you can’t visit Prague without trying a Pilsner — after all, it was invented in the nearby Czech town of Plzeň (or Pilsen in English). This beer, a pale lager, was first produced in the Czech Republic back in 1842 and should definitely be at the top of your list of things to drink in Prague. What’s even cooler is that the world’s O.G. blond lager, Pilsner Urquell, is still produced in Pilsen (even as you continue to read this sentence). Since the Czech Republic is the country with the highest beer consumption per capita in the world, however, why limit yourself to just Pilsner? 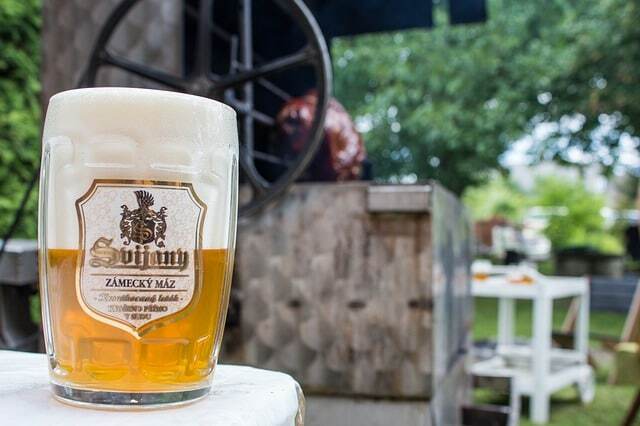 Czech out U Fleků Brewery and Restaurant and sip on some of their dark beer, or guzzle some other top selling brands like Krušovice or Starobrno. And if you really want to do it in style, try one of the spots on our list of outdoor places to drink in Prague or consider soaking in a bonafide beer spa! Becherovka (pronounced Bekh-er-ofka) is an herbal bitters you’ll want to drink in Prague. Mainly, that’s because it tastes like the holidays in a glass (trust me — we’ve got a whole bottle of the stuff in our liquor cabinet at home. When we use it for cocktails in the summer, it gives new meaning to the phrase “Christmas in July”). Perhaps that’s because it has flavors of ginger and cinnamon? Who knows? Truth be told, however, Becherovka is made from a super secret recipe that involves a bevy of herbs and spices. In fact, only two people in the entire world are lucky enough to know the secret of the entire production process, so let’s hope for their sake — and ours — that nothing happens to both of them at once! Becherovka, whose alcohol content clocks in at 38% ABV, is produced by the Jan Becher company in Karlovy Vary, Czech Republic. If you’re a ‘90s kid, ask for a beton, or Becherovka and tonic: apparently this cocktail was pretty popular in the Czech Republic during its heyday in the 1990s. You’ve probably heard of absinthe — also called the “green fairy” — but did you know that it’s popular in Prague? The Czechs have been making absinthe for a good part of the 20th century, just like the French and the Swiss. Admittedly, ordering this widely available drink is probably going to mark you as a tourist, but there are a few things to know if you want to try absinthe in Prague. First, at 70 proof, it’s not for the faint of heart. Second, Bohemian-style absinth or Czech-style absinth — that’s not a typo, as this kind is spelled without the “e” — is a Bohemian version of the spirit, with Bohemia referring to the westernmost region of the country. This kind usually contains little to none of the anise flavors associated with traditional absinthe (good news for some of my friends who avoid it precisely for this reason). Note that not all absinthes from the Czech Republic are Bohemian-style, though. 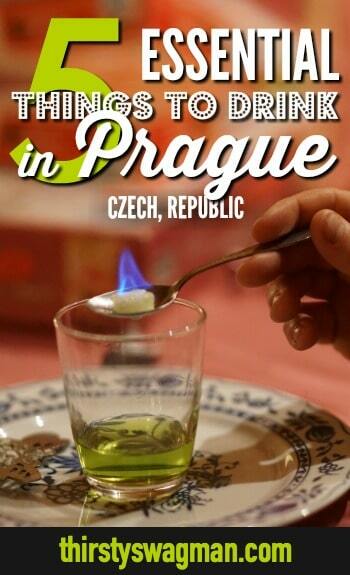 Finally, if you drink absinthe in Prague, you’ll take part in the “fire ritual” (not as crazy as it sounds, we swear). 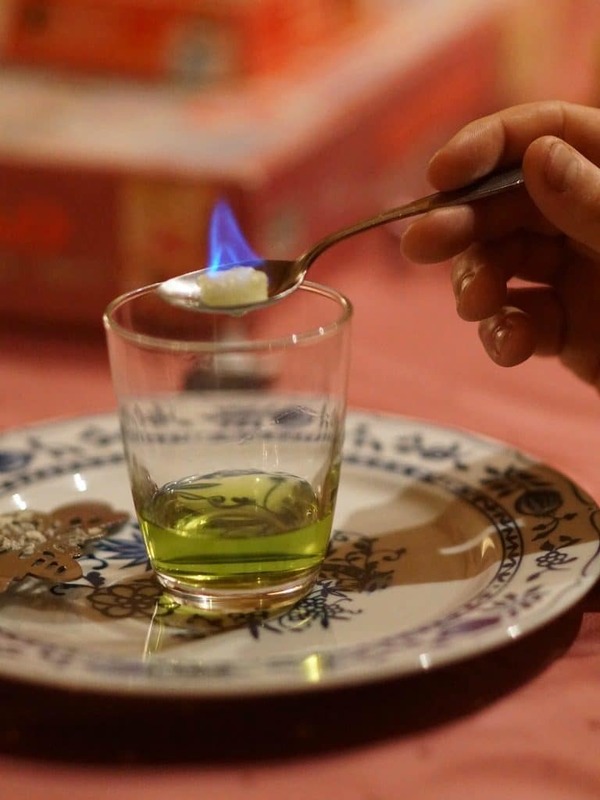 Once absinthe’s in your glass, a spoon containing a sugar cube will be placed over it. Said sugar cube will be doused with absinthe and set on fire, dropping into the absinthe itself. Put out the blaze with some water, and you’re set. If you’re in the region during September, you’ll get to try something extra special: burčak. Pronounced bur-chak, this drink doesn’t exactly have a direct translation. However, it’s sometimes referred to as “young wine,” and it’s something you’ll want to drink in Prague. Basically Czech winemakers take some just-pressed grape juice and let it ferment for a couple of weeks (with lots of sugar added, of course), and the result is a drink that’s a middle ground between wine and grape juice. Because it’s available right after the harvest — i.e., only a few weeks in September — it’s got that special aura of a “limited time only” kind of drink. We won’t fault you for drinking multiple glasses — but be careful, because even if it doesn’t taste strong, you don’t want to be stumbling home unexpectedly! Slivo-what now? This drink, also known as plum brandy, is believed to have originated in Moravia. (Makes sense, since brandy is a spirit produced by distilling wine, and as mentioned earlier, most Czech wine comes from southern Moravia.) Pronounced as “sli-voh-viss,” it’s mostly served in small shot glasses. Slivovice is commonly enjoyed at room temperature; it’s almost never served on the rocks. Ready to grab some friends and drink in Prague? Check out our Beer or Bust tour packages now!